After last Saturday's hunt, Elsa and I weren’t 20 miles from the Pine Hill property when the cell phone rang… it was Bobby. “I’ve got this great recipe for pheasant and we need to cook these birds!” he explained. 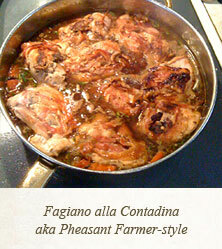 A day later the hunting party gathered, along with our wives, and watched Bobby prepare a truly amazing Mario Batali dish called “Farmer-style Pheasant“, from his book Molto Italiano. The pheasant was served with a side of roasted garlic potatoes and homemade pumpernickel bread. A bottle of Marraso 2006 Cabernet Sauvignon rounded out the meal. Upland hunters appreciate the connection between the environment, the dogs, and the birds. People who strive for healthy eating will recognize that free-range game birds provide a lean, high-protein meat; the epitome of organic food. Looking back on the previous day’s hunt, while enjoying a wonderful meal with great friends, I could not think of a better ending to the weekend.